Jeanne Pegg and her grandson Ryan bring up the gifts during the 125th anniversary Mass at St. Katharine of Siena Church in Wayne. St. Katharine of Siena Parish in Wayne, which closed out its 125th anniversary with a June 5 liturgy, is definitely not slowing down with age. The median age in the community is 33, according to Msgr. Brouwers, and he believes that is partly because Wayne has many large homes and as older families downsize, younger families who have several children move in. “The fathers have very good relationships with their sons and daughters,” he observed. This is especially noticeable when there are events surrounding youth activities, perhaps CYO or a retreat, and both parents usually attend. Wayne itself was developed by investment banker Anthony Drexel (the uncle of St. Katharine Drexel) and his friend, George Childs, publisher of the former Philadelphia Public Ledger. The area was very rural but chosen by them for its prime location along the route of the Pennsylvania Railroad in what would be known as the Main Line. As an inducement to home buyers, Childs and Drexel donated plots of land to the various religious denominations, including the Catholic Church, with a stipulation that a church must be built within three years, according to a St. Katharine’s parish history. Although there were not many Catholics in the area at first, an estimated 70 families with 300 members, a parish was established with Father Matthew Hand as pastor. A temporary chapel was erected within months and the permanent church completed and dedicated by 1896. 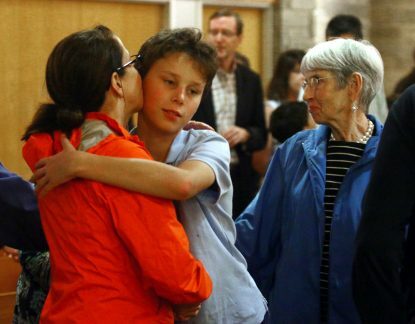 Luke Miller, who attends St. Katharine of Siena School, offers signs of peace to his mother and grandmother, Nora and Theresa Brennan. In 1916, under the third pastor, Msgr. Charles Kavanaugh, a school was opened with the Sisters, Servants of the Immaculate Heart of Mary as faculty. As was fairly common at that time, it also included a small two-year commercial course that over time developed into a full four-year high school program. It continued until Archbishop Carroll High School opened in nearby Radnor in 1967. Meanwhile the little church of 1896, which seated 350, was beautiful but it could no longer answer the needs of the growing congregation. Today’s church, built under Father William O‘Donnell, was built and dedicated in 1996. But the real heart of a parish has little to do with buildings and a great deal to do with parishioners. 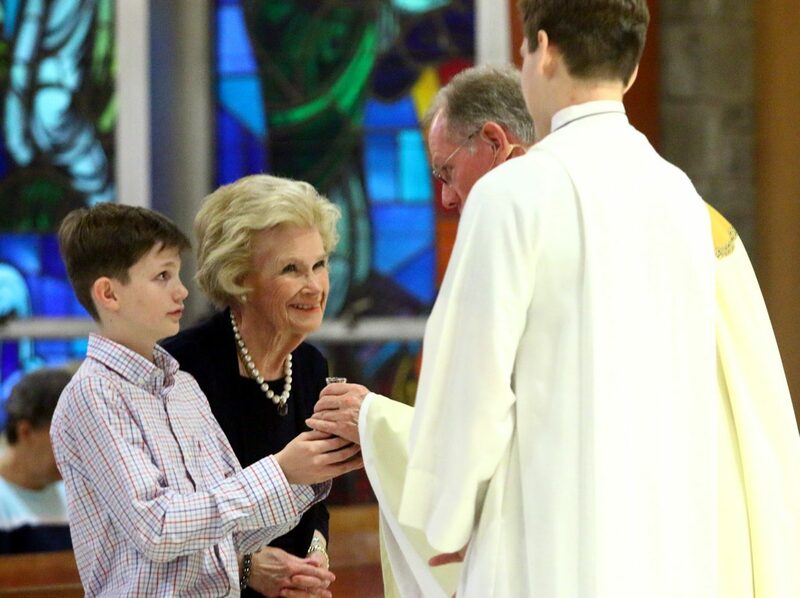 Jeanne Pegg and her late husband came from Chicago to the parish 41 years ago. “The parish was very welcoming,” she said. “We raised our three boys here. We made a lot of lifelong friends here and we’ve watched their children grow, and now their children grow as well. One of my sons is in the parish with children in the school. The parish has been a great blessing in my life. Greg Grimm and his wife Rosemary have been parishioners since 1990 and sent their two children to the school. Sister William Therese, he remembers, was a fantastic principal when his children were in school but that doesn’t take anything away from her successors, including Frank Tosti, the current principal. Grimm believes the parish did lose a handful of people at the height of the clergy scandals but it is undergoing a real surge in spirituality under Msgr. Brouwers. “He has really helped in the healing process,” he said. A focus of parish devotion is the century-old Blessed Mother Shrine, and there are also many ministries and prayer groups. More recent among them is the Knights of Columbus Council, chartered four years ago, of which Grimm is the current grand knight, as well as a women’s spirituality group, Walking with Purpose. Grimm also credits the strong youth group ministry under the direction of Stephanie Twohig. St. Katharine of Siena Parish seems well positioned to continue to teach the Word of Jesus as it enters the next century and a quarter. 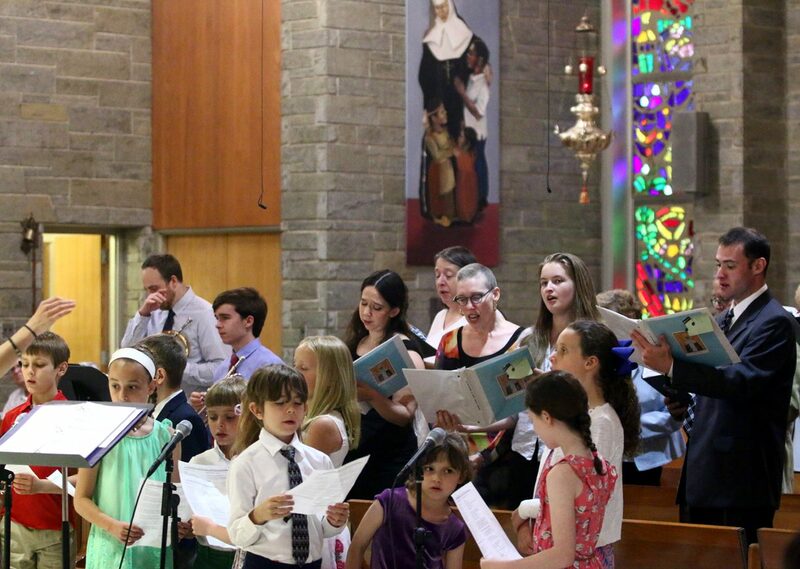 The parish choir leads the congregation in song.